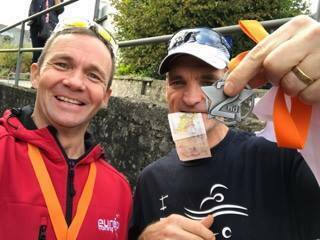 PLYMOUTH Triathlon Club claimed four podium finishes and seven top 10 age category spots at the Dartington Duathlon on Sunday. Iron-distance stars George Prewett and Ken Holder were the club’s top two leading athletes home in the standard distance competition, which involved a 10k run followed by a 40k bike ride and then finish with a 5k run. Prewett finished in two hours, 11 minutes and 38 seconds to finish fourth overall and third in his age category. Holder was eighth overall and second in his age section in a time of 2:17.57. Tom Jennings was the next Plymouth Tri Club member home in 10th spot overall, finishing in a time of 2:19.40. Just behind him in 11th was David Hurrell in 2:19.54. Neil Minion was 20th overall and second in his age category in 2:29.16. There was also a second category spot for Lucy Spowart in the women’s race. She clocked 2:55.51 to finish eighth overall. Dawn Turner was 18th overall and sixth in her category in 3:12.47.